Data Loaders can be used in a multiple database environment. You may have production databases for a variety of geographical regions as well as various non-production databases such as test and development databases. Each Data Loader is equipped with a Set Up button which allows the user to select the database that contains the data they need for their work. When they click the Set Up button, a user will be presented with a screen from which they can select the database they need. 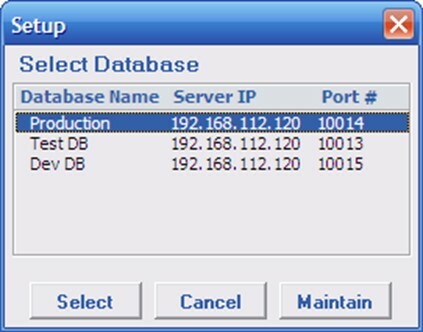 This screen will only show those databases that are available to the user. Your IT department will set up the database list and privileges prior to publishing the Excel Loaders templates to the corporate network or intranet. IT can later use the password-protected Maintain button to make changes to the database list. Typically, users will work with the main QAD databases and ADM databases only and would not maintain any custom side databases you may utilize for custom fields. However, custom databases can be added to the menu, if needed. Generally, though, custom database are created to process custom fields during uploads, which would be handled in the back end process session configuration of Data Loaders.